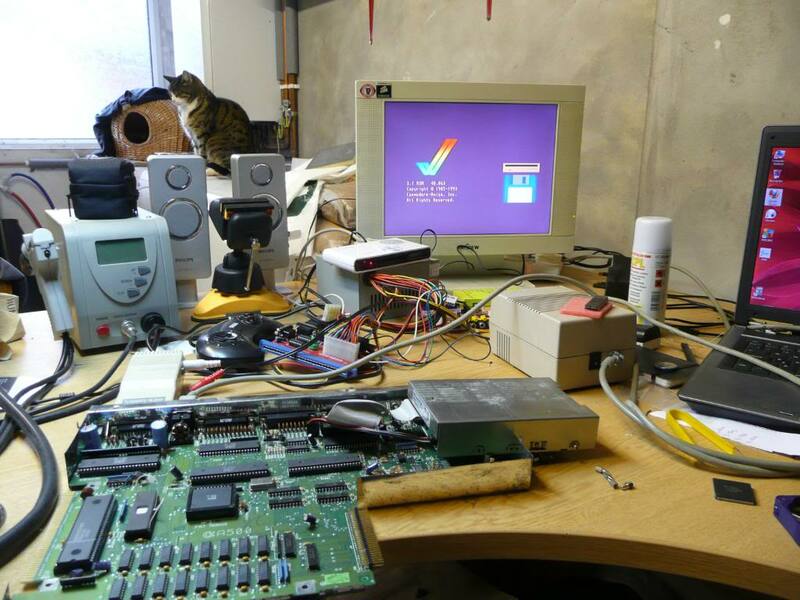 I fixed up an Amiga 500 (not plus) today and wanted to install a newer ROM. I burned v2.04 and v3.1 onto 27C400 EPROMs and installed. I was greeted with a red crash screen which usually means there is a problem with the ROM code/chip. On a Revision 5 motherboard (which is what Ive got) pin 1 of the ROM is not connected but pin 1 on a 27C400 is address line 17 and should connect to address line 18 of the 68k CPU, which is pin 31 of the ROM socket. Also the ROM needs to be set to WORD mode. The selector pin for this is pin 31 on the 27C400. To make this all work we need to lift out pin 31 of the 27C400 and solder a link between this pin and pin 21, this gives us a permanent HIGH which sets it to WORD mode. Finally, solder a jumper from pin 1 of the EPROM to pin 31 of the socket.